What do moose eat in general? What is it that nourishes an animal of that size? Quite common things with rather low nutritious contents - but masses of it!!! In first instance you can say it is vegetarian diet he prefers - and the lushy, fresh one - he is a type of gourmet of leaf, you know... so don't be worried to end as a moose's meal yourself ! He one the other hand chooses from the plants those with many nutrients and low fiber, wherever possible. They eat twig ends, leaf, roots and even the bark of a variety of - mainly deciduous - trees such as willows (a mooses favorite!) , white birch, trembling aspen, black poplar, beaked hazlenut, red osier dogwood, red/striped maple, pin cherry, especially in winter also balsam fir. Summertime offers a lot more for moose, such as berries, apples, wildflowers, lichens, bushes, seeds, ferns, mushrooms, tubers, sedges and grass. In winter they more switch to conifers then. Actually moose are particular with the choice of plants - if they can choose, but have a quite high adaptability in order to survive, and their range of plants is big. The bark, mainly eaten in winter, has a quite high nutritional value and is additional a source of non-frozen water. Beware of the moose could be a good slogan for hobby gardeners - if the moose enters the civilised world, he loves vegetables and fruit that much that nothing might be left for the humans. European moose have sharper teeth compared to their North American relatives, so they can feed on harder bark. Ludwig's, one of the moose in "Moose Garden" in Sweden (call it moose farm), special sweet are bananas ! 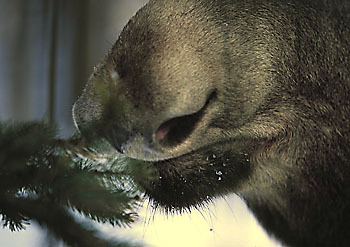 By the way: The things moose eat are called moose "browse", originating from their browsing on twigs. "Under water" and how about minerals? Adding to that diet is highly digestible aquatic vegetation such as water/yellow pond lily, water shield, horsetails, bladderworts or pondweed, which moose dive for in ponds as deep as 6 meters to find these specialities, which add minerals and nourishment. So they don't go for fish when you see them head under water! Moose prefer aquatic vegetaion more in spring and early summer than in the really hot times. 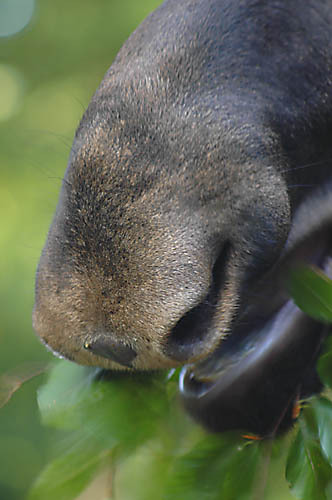 Actually moose seem to eat less aquatic vegetation, if they can derive their mineral needs by salt-licks, which seems to be the case with the Western moose in North America. Mineral licks are ususally soils naturally rich on minerals. Moose lick on, or eat the whole soil. Minerals are essential for antler/hair growth and milk production, and also after winter to re-fill the reserves used up during the time full of privations. The main thing they are looking for is actually sodium, which water plants are rich in. Normal plants are mainly rich on potassium, the sodium is required for a healthy balance between both elements. Some water plants have up to 500 times more sodium than normal plants! But water plants can mainly be found during June/July. As salt is not so easy to find in winter, they also lick it from roads, where it is used to defrost. The minerals required are found in silt and loess-soils found in the northern temperate zones, which forms the main habitat of the moose. These soils, combined with usually young eco-systems, gives rapid plant growth of nutrient-rich and soft plants - the perfect food for moose. 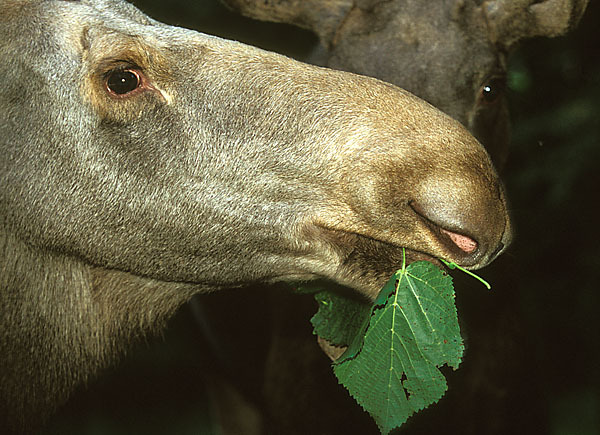 Some of the food moose are consuming is toxic as a self-defense of the plants against such feeders like the moose. Only - it doesn't help them in this case. Moose have a very large liver in order to break down toxic secondary plant compounds. A moose's body is not working with glucose such as the human one, but with fatty acids, which can be extracted from the cellulose of the fiber. Glucose is only used for their brain. How much do they eat and where do they find it ? How about winter diet? 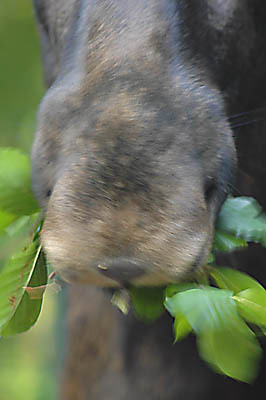 Moose often don't bite off plants, but pull them out (e.g. grass), so they can get the parts of the plants with most nutrients! They can reach high up into trees and sometimes break away huge branches to harvest the foliage unhurriedly. On the other side they can go down on their knees to feed on ground level. Moose can feed between 15-50 kg daily ! In summer with rich food supply they require around 20-30 kg, in winter 15-20 kg. To consume such a mass of vegetation that they use 10-13 hours a day searching for food, especially in early summer. In winter they rest longer than in summer times, where do little else than feeding, finding food and resting. They show high feeding activity starting 6.00 in the morning. The peak feeding times are varying depending on the time of the year: Typical seems to be four peaks in late spring, but only one in January! Usually they feed about one hour, then they snooze for some time. If the food supply is bad, the feeding- and resting periods increase. If the food supply is good, the feeding period get shorter and consequently moose feed more often. The distance to find the amount of plants they need varies between 200 and 300 km especially in winter, when it's harder to find food: Lakes are frozen, no young shots are available - the moose is limited to shrubs and coniferous trees. While snow prevents partially feeding on ground plants, he still digs down to 40 cm deep to find e.g. blueberry undergrowth. The moose must take care not to eat too much of thick branches - as this is very hard and time consuming to digest he might starve with filled stomach, so they use mainly twigs of 3-4 mm in diameter. When not finding enough food they also tear of bark from trees with their lower incisors. A bull moose can loose over 120 kg weight over winter time ! Moose can only survive this change in diet by adapting their digestion. Instead of drinking they lick snow to satisfy their water budget. Often they break down sprouts to reach upper twigs. Bulls don't feed during the mating season and can loose quite some weight during that time. Moose calves use the rich milk from their mothers during the first 6 months, while the change towards solid food starts already after a few weeks. Ever seen moose on their knees? The reason is the size of the animal - it is built to feed on a certain height. If a moose wants to eat grasses or mushrooms he needs to go on his knees or spread his legs like a giraffe to reach the ground. On the other hand the size enables the animal to reach high branches and even break those up to 2,5cm thickness down to reach the young twigs. The first time they swallow more or less unchewed. Moose are ruminants. Their stomach is built in such a way, that after swallowing, the food is kneaded/stewed/fermented in the rumen (one of the four areas of a ruminants stomach), where micro-organisms (anaerobic bacteria digesting cellulose) are added starting digestion. The rumen of the moose is comparably small, as he prefers food with low fiber. From the rumen the food is going into the reticulum (or honeycomb stomach), where it gets pulp. Rumination usually takes place when the moose is lying on the ground (what they extensively do when you would like to watch them or takes photos). After that the food mush is throttled up into the mouth and chewed again with ~80 rounds per minute- the typical part indicating a ruminant. This action is accompanied by choking sounds-a little bit like the burp of a human. If they only find fiber-rich food they can actually starve, as their rumen gets filled with that fiber and cannot work any more. The remaining compartments of a moose's stomach are called omasum (or manyplies) and abomasum (rennet stomach). By rumination ferments and the involved bacteria and protozoa are utilised and by that their proteins. Ruminants need therefore less food than other herbivores. Due to the pre-digestion of the herbal food they also only require smaller teeth than other herbivores. The dung of the moose can be in different shape depending on the season. In wintertime the dung is hard and oval (pellets), looking like (~1.2 cm long) little small eggs (which tourists in Sweden can buy in small bottles - feel free if you feel like :-). Around 15 piles of these droppings a moose can create a day, that equals to approximately 400 nuggets per day (more than 100.000 nuggets a year). Due to the seasonal nutrition -rich on roughage and low on water- the dung contains lots of cellulose - an optimal base for paper manufacturing (don't laugh, it's true!). In summer it is quite soft (lots of water also in the plants), still having the base form of small eggs, but sticked together. It looks more like a cowpat, especially in the transitition between the seasons. The following overview shall show main moose food, there is of course much more a moose eats, such as berries, apples, wildflowers, lichens, bushes, seeds, ferns, mushrooms, tubers, sedges and grass. S yes Water/yellow pond lily Teichrose Nuphar sp. S yes Horsetails Schachtelhalm Equisetum sp. S yes Bladderworts Wasserschlauch Utricularia sp. S yes Pondweed Laichkraut Potamogeton sp.